This was our pan full of peppers before baking. I don’t know how many servings this might be in a regular household but this was about four and since we ate it as a main course we cleaned it up. 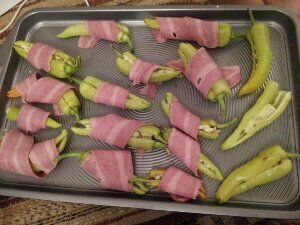 • Wrap bacon around each pepper. 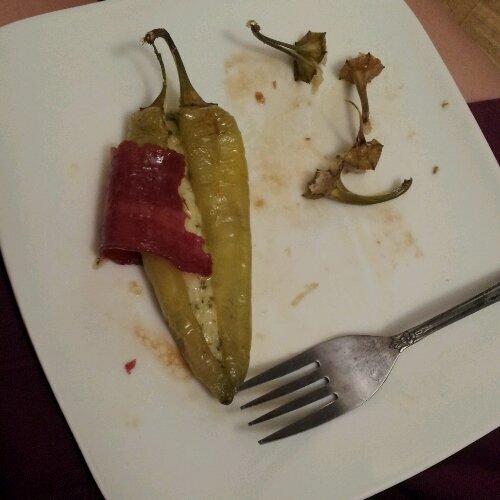 We cut one bacon strip in half for the small peppers. Bake in oven 350° for 30 minutes or until peppers are tender, bacon is cooked and cheese is melted. The final product looked like this. You can see that I barely remembered to take a picture of them. I used turkey bacon because that is what I usually keep in my fridge. I also used some of Kenny’s Farmhouse Cheese. I used the onion and chive cheese, which crumbled and mashed nicely into the peppers. I also just found out that Kenny uses vegtanle based rennet to make his cheese! So all y’all veggie people are good to go. The sweet banana peppers I got from dad’s garden and boy oh boy are they delicious! I am not paid nuttin’ to mention product names. I love their cheese and I felt decadent using something other than Walmart cheese. Heh. 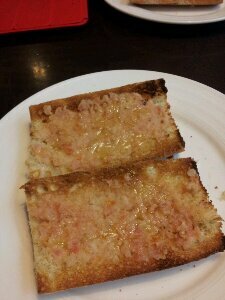 If anything can be the staple of a country it must be the bread in Spain. 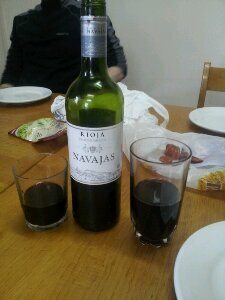 Followed closely by the local wine and coffee. This was a snack or light breakfast that I discovered by way of the lovely Chinese woman I met on trail. Yan has lived in Spain for several years. During her time there she learned language, worked and found all the awesome foods. Tostada con tomate means toast with tomato. The unlisted ingredients makes it delish too. Diced or mashed up tomatoes mixed with olive oil and spread on toast. Sprinkle with black pepper. Maybe it doesn’t sound too special, but I can promise it is good. I can’t wait for my garden tomatoes to come up so I can make this for my hubbster. 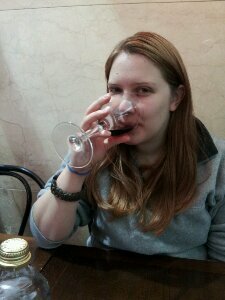 Red wine (vino tinto) was another common sight in Spain. Every single town had their own brand of wine. I don’t just mean the wealthy towns either. I mean the po-dunk of the bunch with a population of 200 or so. You want to know what comes from the town of 350 where I grew up? Mullets. The folks in Spain have as many bodegas (wineries) as we have cricks around Kentucky. Crazy frequent. Like I said, bread is a staple. We had some sort of bread with every meal. 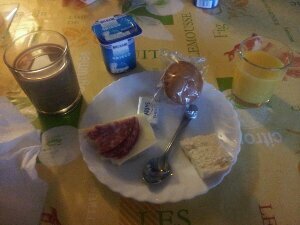 The particular meal (pictured above) is a breakfast made up bread, bread, and bread, with coffee and juice. Really. There were two sweet breads and a toast for breakfast. Other meals were usually served with a crusty French bread. Some wineries took their business very serious. 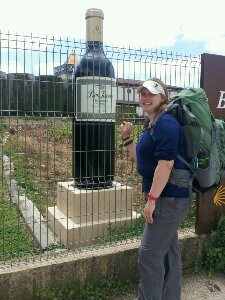 This huge form of advertisement was along side the Camino and invited a photo. I could feel as though I had earned that sickness. I’m normally an anytime of day type of coffee drinker, but this espresso I had to be careful with. 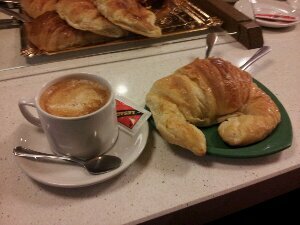 Typically, I drank the cafe con leche. Not cold milk, this was heated and sometimes frothy. As you can plainly see, this was a midmorning snack of champions. Chips and coffee. There were some bread crusts and chorizo. 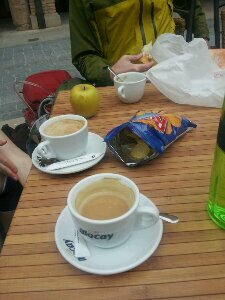 Just remember, if you end up in Spain and it is not during one of the strangely late meal times you can always have bread, coffee or wine.